Cancer is uncontrolled cell growth. 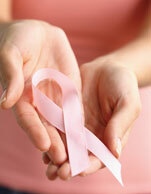 Breast cancer is a malignant tumor that starts from cells of the breast. Each year an estimated 200,000 women will be diagnosed with breast cancer. Surprisingly, 1,700 men will also receive that diagnosis. There are many types of breast cancer and most are identified by where they originate. Some breast cancers begin in the cells that line the ducts (ductal cancer). Lobular cancer begins in the lobules and a smaller number of cancers begin in other tissues. In a healthy person, normal body cells grow, divide and die in an orderly fashion. Cells divide rapidly as a baby grows into a child and a child into adulthood. As adults age, most cells divide only to replace worn-out cells or repair injuries. According to the American Cancer Society, all cancers develop when cells in a part of the body begin to grow out of control. Cancer cells outlive normal cells and eventually displace them. The best way to survive cancer is to discover it early and obtain medical treatment. That’s why it is so important to know the warning signs of cancer.